This is becoming a bit of a fixture - the 3rd we have done for them - can't be bad! Nice venue - only thing missing is a kitchen. All we have is a room and some tables. Luckily I live almost across the road so I could use the kitchen at my house plus chafing dishes in our wannabe-kitchen. The other folk who were supping pints in the bar thought I was cooking it all outside in the van..... well there's an idea! 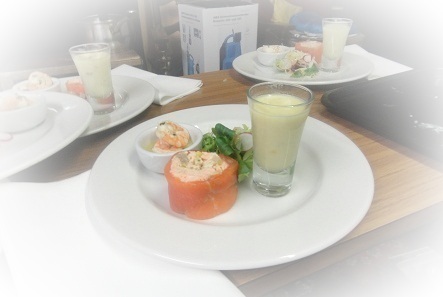 Trio of fish starter - tiger prawns in garlic butter, salmon rillette wrapped in smoked salmon and shot glass of smoked haddock chowder. So I came up with this trio of fish starters - always trying a different variation. The smoked haddock chowder in a shot glass had gone down so well at an event we did just before Christmas we had guests coming in to the kitchen begging for more. 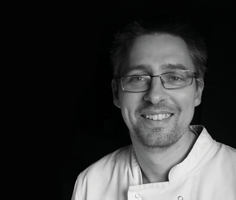 And garlic prawns - well everyone loves those. We had those frying in a wok on a camping gas ring - the aroma filling the bar making everyone hungry.